Alehorn of Power VII will take place at Reggie’s in Chicago on Saturday, November 2nd. We know all of you are accustomed to seeing Alehorn as a summer event, but to get the bill where we wanted it, i.e., more devastating, took a little extra time. We think you’ll be pleased with the results. 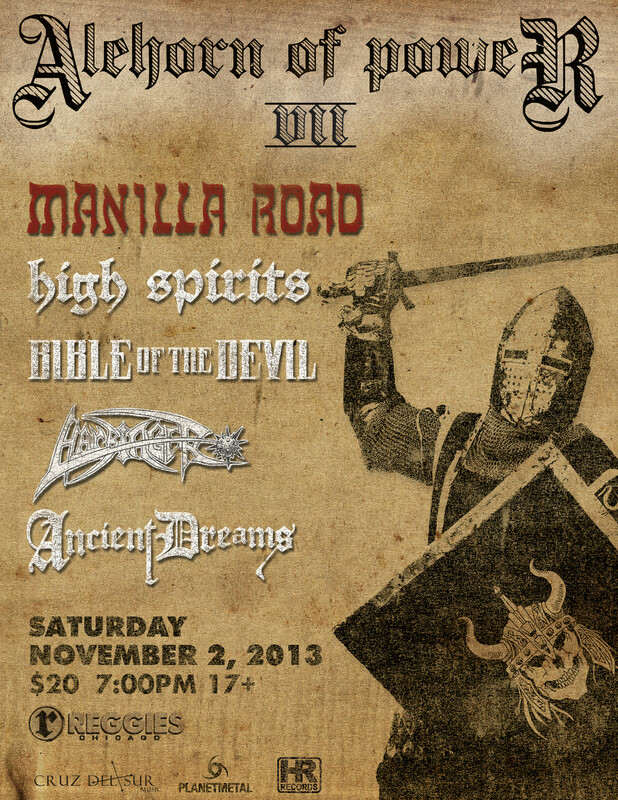 Without further delay, we’d like to welcome back MANILLA ROAD as the headliner of Alehorn of Power VII. MANILLA ROAD headlined the very first edition of Alehorn in 2006 and we are excited to have Shark and company back for what will be a blistering set of dominance. Wichita, Kansas’ finest have been on the festival route all over the world for much of the year so please do not miss them as this show will be their last of 2013. Chicago’s HIGH SPIRITS will make their Alehorn debut this year. Fresh off their Keep It True performance to thousands in Germany back in April of this year, HIGH SPIRITS is a welcome addition the bill and their unique brand of high energy rock will get your fists in the air. This will be their first show in Chicago in almost 18 months. Filling the middle of the bill will be Chicago’s own BIBLE OF THE DEVIL. As a long standing participant in Alehorn, BIBLE OF THE DEVIL unleashes its new lineup after being on hiatus for most of 2013. The new lineup is more ultra then ever and this will be their first Chicago show in nearly a year. Reactivated cult favorites HARBINGER will make their Chicago debut at Alehorn this year. Hailing from Lansing, Michigan, and united by their love of NWOBHM and early American speed metal, HARBINGER guarantees to deliver the Powertime as only they know how. ANCIENT DREAMS rounds out the bill as the opener. A relative newcomer to the Chicago scene, its traditional mix of doom and metal is influenced by the might of Candlemass, Diamond Head, and Helloween.